When I try to answer this, the first person who comes to mind is not the guy who pulled a box cutter and took $7 off me in eighth grade, or the high school bully who forced me to sing the Saved by the Bell theme song under threat of being rolled down 96th Street in a garbage can. It’s Wojo. Yes, Wojo. 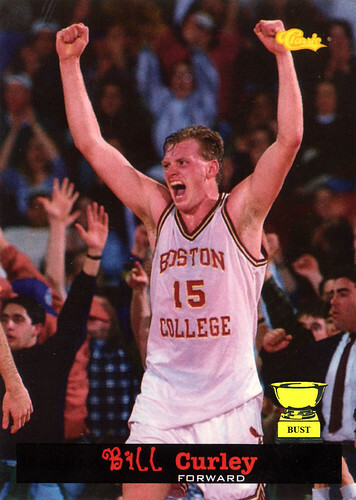 Hardcourt-slapping, charge-drawing, pass-and-cut-awaying Steve Wojciechowski, the honorable-mention All-American who played point guard for Duke from 1994 to 1998. I’m probably not alone in feeling this way — the Washington Times called him “the most reviled 6.6-point scorer in NCAA basketball history.” But if I took a moment to think about it, I could probably come up with more reasonable people to hate. No, not Saul Smith or Casey Jacobsen or Toby Bailey (well, maybe them), but someone more worthy of such powerful and raw emotion. In the moment, however, few things make my blood boil like some ACC pretty boy or deadeye shooter or egregious flopper or hard-nosed defender — or some unholy amalgamation of all these qualities. Our hatred of college basketball players may be shallow, but damn is it salient. So, with the NCAA tournament beginning next week, Grantland has decided to kick-start March Madness by celebrating the athletes who make us maddest. 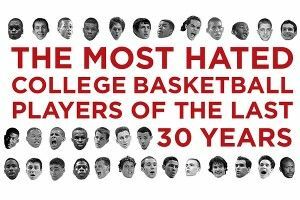 Behold, a bracket to determine the most hated college basketball player of the last 30 years. The 32-player competition has four regions — one each for players from the 1980s, 1990s, and 21st century, and another for Duke Blue Devils. Before Coach K and the Cameron Crazies get too worked up about being singled out, let me explain the decision to turn part of this bracket into a mini-tournament of Duke hate. For starters, imagine the alternative. Think of all the Dukies who didn’t make the cut: Carlos Boozer, Kyle Singler, Trajan Langdon, Brian Zoubek, Ryan Kelly, the Brothers Plumlee, Chris Collins, Thomas Hill, Alaa Abdelnaby, and many, many more. If Duke weren’t confined to its own quadrant, half the athletes in the competition might be Blue Devils. And if they were peppered throughout all the regions, an all-Duke Final Four wouldn’t just be a possibility — it would be a likelihood. Sure, a lot of people hate Joakim Noah, Eric Montross, and Derrick Coleman, but when it’s nut-cutting time would a majority of sports fans choose them over J.J. Redick, Christian Laettner, and Danny Ferry? Besides, isn’t being hated by the rest of America essential to the experience of supporting Duke? Blue Devil fans know people will revel in the upsets to Lehigh and the lackluster professional careers of Cherokee Parks and Chris Carrawell and William Avery. They know people will cry conspiracy every time the refs give Duke a questionable call. They know people will feel like bashing their heads into their flat-screens every time Clark Kellogg singles out an “impressive young man” on Coach K’s roster. Of course, the Duke alumni and coaches and players must know that the real reason they are hated is because they are so damn good. And for all of us college basketball fans who are so damn stubborn, hating Duke is the most comfortable and covert way to appreciate the program’s team success and the individual brilliance of guys like Elton Brand, Jay Williams, and Grant Hill. So yeah, respect to Duke for all the success, but Laettner should have been tossed from the perfect game for stomping that dude from Kentucky, and his buzzer-beater was lucky. And Thomas Hill — come on, man, why are you crying? With the rest of the bracket, we’d like to explore the different levels and flavors of college basketball hatred. What’s worse? The antipathy for Patrick Ewing, whose dominance at Georgetown seemed to scare Big East crowds into vile and blatant racist taunts? The way Pac-10 students cheered “Cher-yl! Cher-yl!” to remind Reggie Miller of his sister, who back then was by far the more accomplished player? Jalen Rose, Larry Johnson, and Allen Iverson represented a sea change in basketball culture. For that, they’re beloved by many but perhaps despised by more. There’s not much mystery to what turned us off about Bill Curley and Eric Montross — they were white stiffs with terrible haircuts. And does anyone bring it all together in one package better than Tyler Hansbrough? Psycho T had it all — accolades galore, 4,000 percent effort, and those bugged-out, demonstrative, lunatic eyes. Plus, during an era in which few players with serious NBA futures spend more than two years in school, it felt like Hansbrough never left. You could hate him year after year after year. So who wins? Well, Christian Laettner wins. But who makes things interesting before that foregone conclusion is up to you. Should you vote for a player who was hated in his time over a guy who just pisses you off? Your call. And honestly, if you never saw Patrick Ewing play at Georgetown and you just want to vote him into the Final Four because he traveled every time he made his hop-skip-jump move across the lane or because he blew the layup that cost the Knicks the 1995 Eastern Conference semifinals, well, we can’t stop you. Just rage out all over this bracket and help us crown the most hated college basketball player of the last three decades. Let’s get started. Vote on our Facebook page now! Rafe Bartholomew is an editor at Grantland and author of Pacific Rims: Beermen Ballin’ in Flip-Flops and the Philippines’ Unlikely Love Affair with Basketball.